From the pictures, pla rad prig looks fancy and perhaps intimidating, but it is one of the easiest, tastiest dishes you'll find. There are two steps: frying the fish and making the sauce. When the sauce is done, pour it over the fish. Voila, you have a beautiful presentation. If you are making Fried Fish with Tamarind Sauce for kids or people who like less spicy food, use yellow and red bell pepper or any other peppers that are not hot. This dish should be great for non-spicy hot eaters. In Thailand, we use pla gow or grouper for this dish, but any meaty white fish can be used for this recipe. 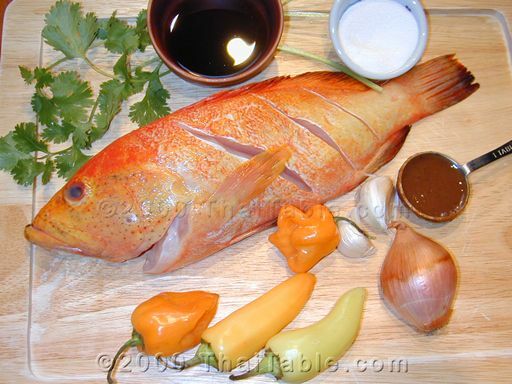 When I picked the fish for the pictures, the red snapper looked so good. The fish was about one pound and it is good for 2 people. My market cleans and guts the fish for customers, so I don't have to. 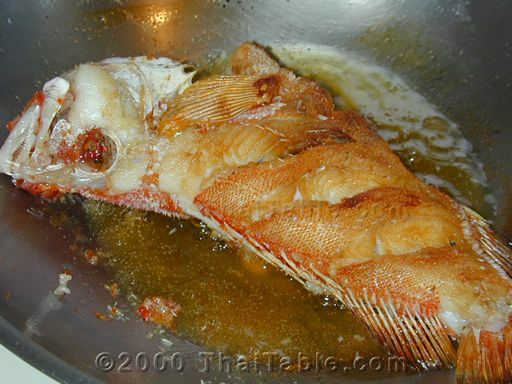 The Fish: Score the fish at an angle all the way to the bones on both sides to help it cook faster and crispier. Add oil to a wok or pan, about half a cup or at least to the side of the fish. Fry the fish on low heat if you like it very crispy, which I do. It should take about 10 minutes on the first side. Don't try to loosen the fish from the pan until it is done, otherwise, the fish breaks up and you end up with not so pretty fish. 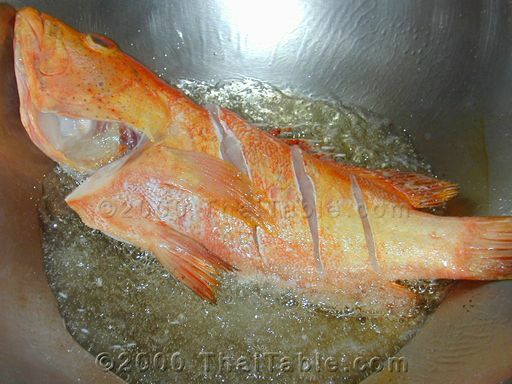 When the first side is cooked, flip the fish to fry the other side. It should take about 5 minutes on this side. Remove and set it on a plate. You can increase the crispiness of the fish by putting it in the oven on 350 until the sauce is ready. The Sauce: While waiting for the fish to cook, peel garlic and shallot. Remove seeds and stem from the chili peppers. 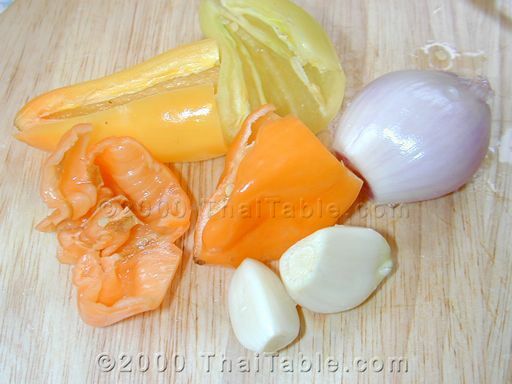 In Thailand, we use yellow and red peppers that are not available here. So I go for the color and use habanero (orange ones) and santa fe (yellow ones). Even with the seeds and white fluff removed, the heat can be on the top threshold of what I can handle. I recommend using one or two hot peppers. If you're not a big fan of very hot food, I would recommend red and yellow bell peppers. And this dish does not need to hot to be good. Chop garlic, shallot and pepper or just put them in a food processor (coarsely chopped). 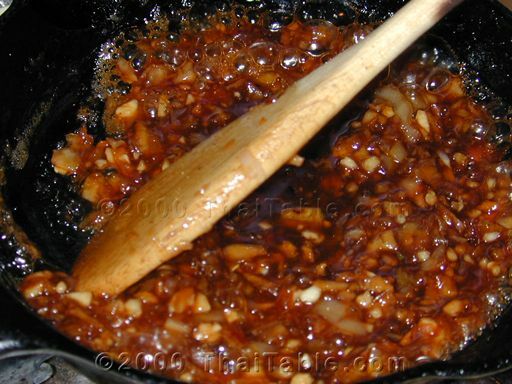 Add a teaspoon of oil to a wok or pan over medium heat. Add the chopped mixture and stir to release the fragrance. If you are using hot peppers, make sure you have proper ventilation because the fumes can irritate your eyes, nose and throat. 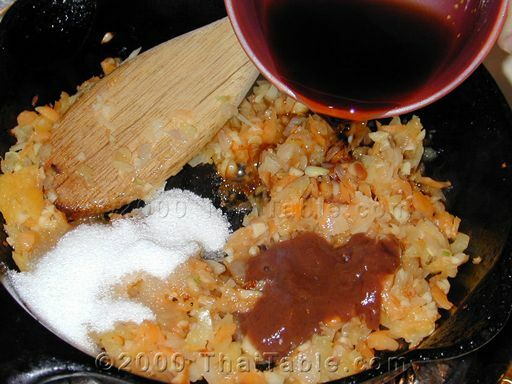 Add tamarind, fish sauce, sugar and a few tablespoons of water. Mix well and let boil. If the sauce gets too thick, add water. It should be the consistency of maple syrup when cooled. Taste and see if you need more sugar, tamarind, fish sauce or just water. The sauce should be sweet, spicy and sour. When done, pour the sauce over the fish and garnish with cilantro leaves if you like.